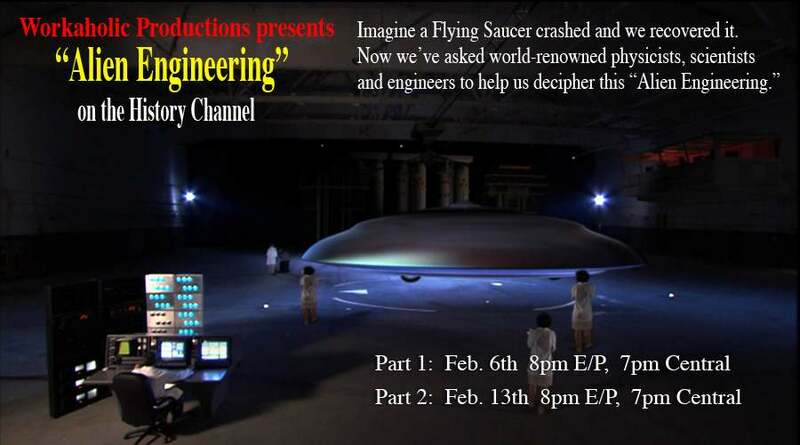 In Mid-February, I was featured as one of the scientists interviewed on television for a show, "Alien Engineering," on the History channel, along with a lot of other scientists such as Lawrence Krauss, Seth Shostak, Frank Drake, Marc Millis, and others. This was a lot of fun. The premise of the show was halfway between "The X Files" and "The Physics of Star Trek." It was: suppose UFOs really were flying saucers from an alien civilization-- if so, what would be the physics behind them? It was an explicitly science-fiction premise, used as a springboard to do illuminate some real-world physics thinking. My one quibble is that the show didn't give quite enough emphasis to the fact that the premise was science fiction (at least, some of the e-mail I've seen proves that they didn't emphasize this enough!) If you were surfing through channels, and missed the very beginning, where they said "this is an exercise in speculation," you could be misled. They didn't repeat that warning, and the rest of the program just says "we captured a UFO...". If you caught just the middle of the program, it would be easy to think "hey, cool! NASA is reverse-engineering a UFO!" ... sorry. The physics is real, but the UFO is Hollywood. Geoffrey Landis: If you say you don't really understand gravity very well you're in good company, because I think not even the best physicists really understand gravity yet. [asked whether it's possible to make an antigravity device] Right now I'd have to say we just don't know. So far gravity is something that acts on us and we don't act on gravity. Geoffrey Landis: If the ancient Greeks at the time of Homer had launched a space mission to the nearest stars and it traveled as fast as Voyager, the fastest space probe that humans have ever launched, and if they launched it five thousand years ago it would still be another seventy thousand years before it would get to the nearest star. It wouldn't even be one percent of the way there. VO: EINSTEIN THEORIZED THAT TIME IS RELATIVE THROUGHOUT SPACE. IT'S GOOEY AND FLEXIBLE. ONE OF THE STRANGE SIDE EFFECTS TO TRAVELING CLOSE TO THE SPEED OF LIGHT IS SOMETHING KNOWN AS TIME DILATION. Geoffrey Landis: According to Einstein, the closer you get to the speed of light the more the clocks on your ship slow down, so time to you passes more slowly. So if you have somebody approaching the speed of light, say eighty or ninety percent of the speed of light, time for them is passing very, very slowly. VO: ANTI-MATTER! THE HIGHEST OCTANE FUEL IN THE UNIVERSE. Geoffrey Landis: If you had one ounce of antimatter, and you could annihilate it with one ounce of ordinary matter you would get an amount of energy equivalent to one million tons of rocket fuel. Antimatter is really the perfect form of energy storage, because you get all of the energy out of the matter and the antimatter if you can make them annihilate. And that's a tremendous amount of energy, but a tremendous amount of energy is exactly what we need if we're going to power an interstellar spacecraft. VO: SO WHAT ABOUT USING THAT TREMENDOUS POTENTIAL FOR FUEL? Geoffrey Landis: Suppose you had one pennyweight of antimatter. That's one-tenth of an ounce of antimatter. The amount of energy in that one penny worth of antimatter would be enough to launch the space shuttle sixty times. VO: A TRANSPORTER THAT CAN REDUCE AN OBJECT, INCLUDING A LIVING CREATURE, INTO A MATTER STREAM, THEN SEND IT TO ANOTHER LOCATION FOR RE-ASSEMBLY... THIS IS TRULY THE ROLLS ROYCE OF ALIEN TECHNOLOGY, AND ONE OF THE MOST CHALLENGING TO ENGINEER. Geoffrey Landis: You'd have to take a human being and you'd have to kind of disassemble that human being and write down the position of every single atom in the body. And then you'd take that information on where all the atoms in the body were and you'd send that information to another place. And then some little assembler on the other side would just put all the atoms together, and when you're done, what have you got? You've got the person you just disassembled. VO: BUT WHAT IF THERE ARE GLITCHES? Geoffrey Landis: It would be kinda scary to get in a transporter and know that, well the first thing that happens is they're gonna rip you apart into atoms. Would you still be the same person once you put yourself together from raw materials? It would be rather tricky to do with our technology because it would take I think about a billion trillion quadrillion bits to write down the position of all the atoms in the body (*), and how would you reassemble them? VO: IF WE STORED IT ALL ON COMPUTER DISCS, THEY'D STACK FROM HERE TO ONE THIRD OF THE DISTANCE TO THE CENTER OF THE MILKY WAY! THE ALIENS HAVE INSTALLED A SUPER-COMPACT SUPER COMPUTER THAT CAN HANDLE ALL THAT DATA. Geoffrey Landis: You'd need some sort of nano-technology that could put all the atoms in the right place and get everybody started up again. Still I'm ready. Geoffrey Landis: I always like to keep in mind one proverb to sort of go by, and that is you should always keep an open mind... but not so open that your brains fall out. VO: WE'VE BEEN INSPIRED BY THE UNKNOWN TO CONTEMPLATE SOLUTIONS FOR PROBLEMS WE MIGHT NOT HAVE OTHERWISE CONSIDERED. Geoffrey Landis: There are two different ways of looking at science. One way says, well, how does the universe really work and how do we know? And the other way of looking at the world is, how could the world really work and what is it that we don't know? VO: WE KNOW A LOT ABOUT OUR UNIVERSE, STILL THERE'S SO MUCH MORE TO LEARN... AND SO MANY OTHER PLACES TO GO. *footnote: actually, a lot more than that.